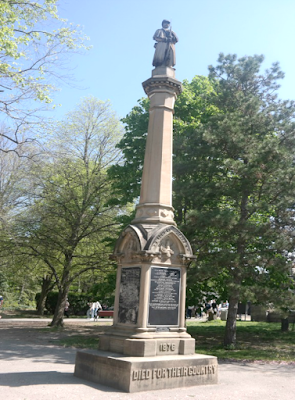 Niagara Falls State Park is located in the city of Niagara Falls, New York. It's listed as being the oldest state park in the United States and consists of 221 beautifully landscaped acres. The park is open to visitors year-round and it's 100% free to visit. You'll find free and paid parking available near the park entrance and in several different designated parking areas. When visiting you'll be able to view the American Falls, Bridal Veil Falls and the Canadian Horseshoe Falls (waterfalls) from several different observation areas. 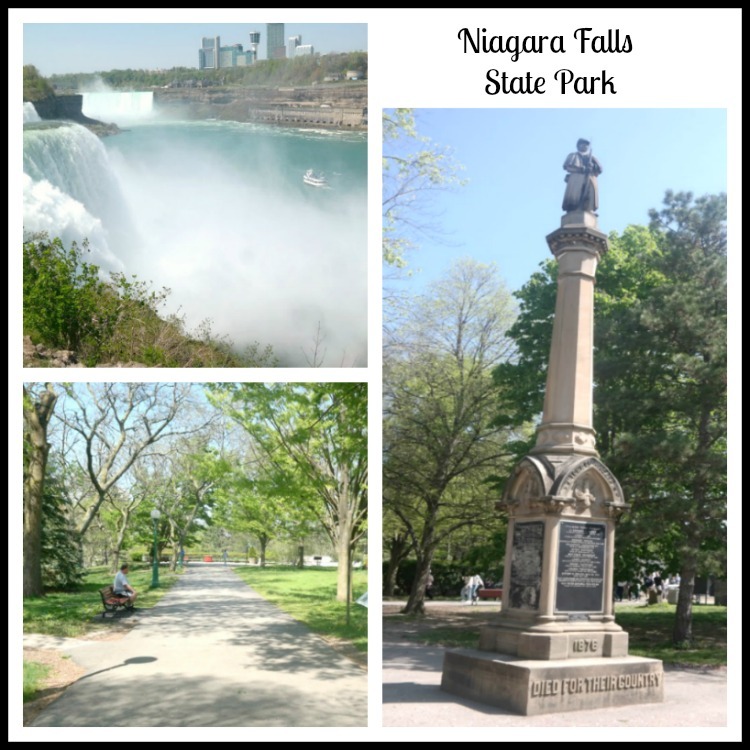 You'll find a visitor's center with gift shop, the Maid of the Mist (gift shop and ticket booths), an observation tower, bridges, walking trails, historical monuments and more! As you walk through the park you'll find "marked" walking trails to help guide you along your way, along with public maps. When you first enter, I suggest you look over the map to get your bearings and to come up with a game plan of where you want to go. After spending a few minutes there, it's pretty easy to navigate yourself around. Strolling the grounds is an easy walk with park benches along the way. If you have issues walking, you may want to consider getting on the Niagara Falls Trolley and taking a scenic tour that way. There is a small fee charged for trolley tours, but well worth it in my honest opinion. The trolley takes visitors all over the park grounds and you can really see a lot in a short amount of time. 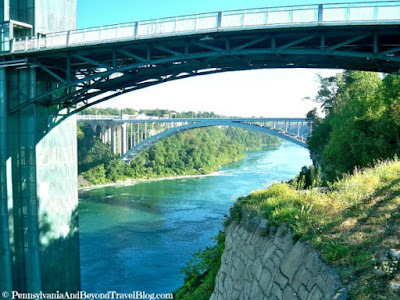 In the photograph above you'll see the observation tower and that's the same bridge and tower that you'll pass through if you've paid a fee to get on one of the Maid of the Mist boat tours. If you want to see the falls from the bottom and looking up, we highly recommend that you do that boat tour! Just be prepared, you will get wet from the mist coming off of the falls. These boat tours last for approximately 15-20 minutes and a new tour starts every 15 minutes, so you shouldn't have to wait too long. If you're taking any electronic on-board, you'll want to protect them from the moisture & water! You can walk across the pedestrian bridge to reach the island where you can get additional scenic views of all three of the waterfalls. The mighty Niagara River runs right underneath that pedestrian bridge and it's pretty cool to see the rapids and how powerful that moving water really is. If you want photographs of the Niagara River and the Rapids...you can get some great pictures when you're standing on that bridge! As you can see in the photograph above, the water was quite high on the day that we visited. On the other side of Niagara River and located towards the bottom of the Falls, you'll see Niagara Canada on the other side. It's a beautiful skyline view and when nighttime rolls around, you've got to check out all of those hotel, casino, business and the twinkling lights! The photo above was taken with us standing above the Falls and looking down towards the city. We spent a total of two afternoons over at the park and still didn't get to see and do all of the things that we wanted to do! We went during the late spring season and luckily for us, the weather was absolutely beautiful and the crowd-size wasn't outrageous. If you're planning a visit...I would plan on spending 3 afternoons or 2 full days just wondering around the park and checking out all of the nearby sights. A few blocks away you'll find the Niagara Aquarium and in my honest opinion, it's a must-see and must-do while you're there. Niagara Falls in New York or Canada is a place that should be on every traveler's bucket list. It's one of the natural wonders in the world that you've got to see to appreciate. 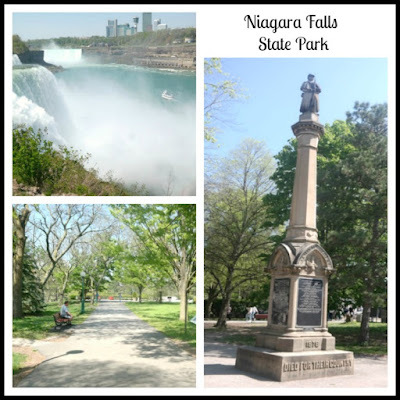 You can learn more about Niagara Falls State Park by visiting their official website online or by looking up our other reviews right here on our travel blog. Note: You can double-click on each photo to have it automatically open up in a new browsing window and in an enlarged size. We're a mobile reader-friendly travel blog, so we keep our images appropriately sized. Thanks! It has been a long time since I went to Niagara Falls. I would love to visit the park and see both sides of the falls.